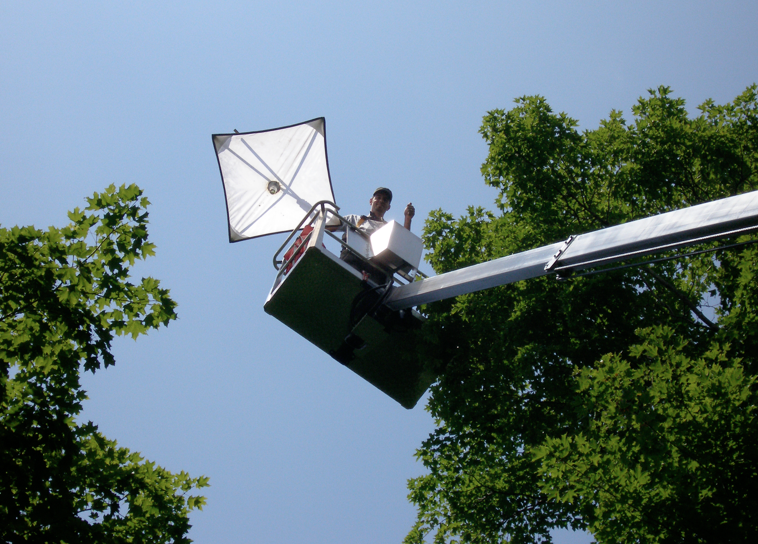 Part 1 of this series highlighted how our laboratory accesses the forest canopy. This post is about our projects related to understanding patterns of Arthropod diversity in Quebec’s forest canopies. I will first highlight some work done by my former PhD student Dr. Maxim Larrivée. Max started in my lab at the exact time that I received the grant for the mobile lift platform, and he become an expert at this machine, and he proved to be an immensely talented student. 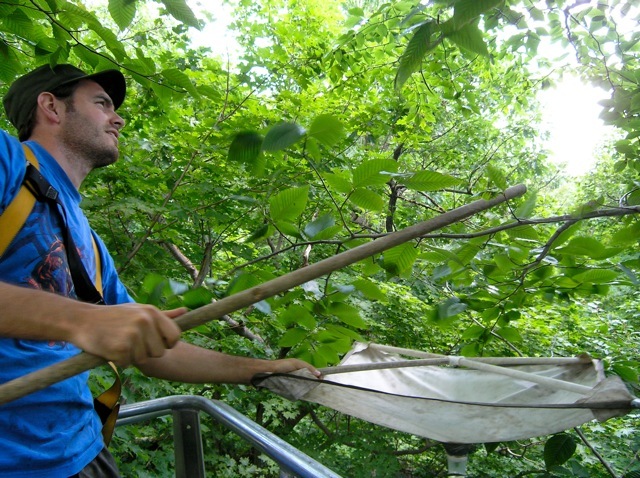 His project was focused on understanding the spatial patterns of spider diversity in three deciduous forest sites located within an hour drive of the Island of Montreal. In the first part of his dissertation, Max collected almost 14,000 spiders representing 82 species (Larrivée & Buddle 2009). The spider fauna of the canopy was markedly different from the fauna from the understorey, and it is likely that different mechanisms structure the assemblages in the two habitats. Overall fewer spiders and fewer spider species were found in the canopy compared to the understorey, but at a species-specific level, there were some spiders that seemed to have a preference for living in tree-tops. For example, the lovely jumping spider (Salticidae) Hentzia mitrata was significantly more common in the canopy. We were also most excited to document the species Mastophora hutchinsoni (Araneidae) in the canopy – this is the famous “bolas spider” and we believe our canopy record may be the most northern record for the species. The Bolas spider hunts by swinging a strand of silk at its prey, and this strand has a “bolas” of sticky capture thread at the end. This species is truly fascinating, and in our system, it is a species that likes the canopy. Max demonstrating the methods of using a beat-sheet to collect spiders in the forest canopy. Here, he is about 25 m above the forest floor. The follow-up work to this baseline study was focused on understanding dispersal potential of spiders in the canopy as compared to the dispersal potential of understorey species. Most spiders in our system are small, so we predicated that their main mode of dispersal was via ballooning (i.e., releasing a small strand of silk and letting the wind carry the spider away). We had also hypothesized that dispersal might be one of the mechanisms behind the aforementioned patterns community structure in the canopy compared to the understorey. Max collected live spiders in the canopy and understorey and set them up in a wind-tunnel in the laboratory. He then documented each species’ propensity to disperse by looking at the frequency by which they showed ‘tip-toe’ behaviour (a pre-ballooning condition). In the paper resulting from this research, we reported that the spiders in our system do have high dispersal potential, but that this potential did not differ depending on whether the spider was collected in the canopy as compared to the understorey (Larrivee & Buddle 2011). This was a fascinating area of study, and we are left with as many questions as we started with! For example, if dispersal potential doesn’t differ between canopy and understorey species, what mechanism drives the differences in community structure between the two habitats? Our laboratory has been studying beetles as well as spiders – although I am personally very interested in spiders, I do recognize the beauty of beetles, and their important ecological roles in virtually all ecosystems. One of Max’s field assistants (Brianna Schroeder) was keen to complete a small project about beetles so she set Lindgren funnels in the canopy and in the understorey. Over 170 species were collected, and once again, the fauna from the canopy was differentiated from that of the understorey (Schroeder et al. 2009). Two other field assistants that worked with Max (Kristen Brochu and Katleen Robert) also worked on their own projects, and together with my colleague at McGill University (Prof. Terry Wheeler), we are close to finishing up a manuscript to describe more patterns of arthropod diversity as a function of vertical stratification in Quebec’s deciduous forests – this work includes beetles as well as flies (Diptera). Although the responses are not the same for the different groups of insects, we are finding that both beetles and flies show vertical stratification in our study sites. Stay tuned for Part 3, which will focus on ecological interactions occurring in the Canopy.